The Australian Architecture Association (AAA) has been committed to revealing Sydney’s architecture and architects to a wider audience since its formation in 2002. This has occurred via the successful matrix of activities including the tours, public lectures, and an Annual Exhibition at The Customs House curated every year by Gerard Reinmuth. This year, we look to a great of Sydney’s architectural history – Bruce Rickard – for a lens through which we can view the classic qualities of the Sydney house. Rickard’s work charts an important moment in Australian architectural history where our local practitioners developed their own language via the application of international precedents. The most famous of these is Glenn Murcutt, whose studies of the pavilions of Mies van der Rohe was exercised in a series of works faithful to the originals before this knowledge was fused with his emergent reading of the Australian landscape to invent a new type. Similarly, Rickard worked through the legacy of Frank Lloyd-Wright. While his houses feature many of the spatial devices for which Wright is known, his best works transform these into something particular to this region and the time in which he worked. Rickard did not collect a group “followers” working in a similar vein, making his legacy harder to define. Yet in Rickard’s work we see early appearances of many strategies which we now take for granted as familiar aspects of Sydney living, including in-built furniture, completely open pavilions, outdoor rooms, systems for managing natural light and the use of local materials. 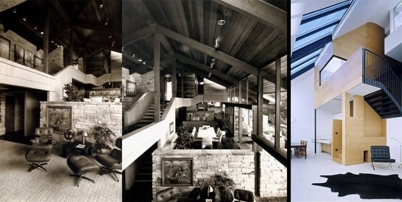 By pairing images of classic Rickard houses with works by a selection of Sydney’s contemporary architects we can see how their interests are still underpinned by these ways of living in Sydney’s landscape and climate which Rickard explored throughout the 70s and 80s. So, while none of these contemporary architects are “students” of Rickard’s, we ask whether their work would be possible without his legacy.